Notre Dame Prep welcomes and relies on the investment of time of our community volunteers. 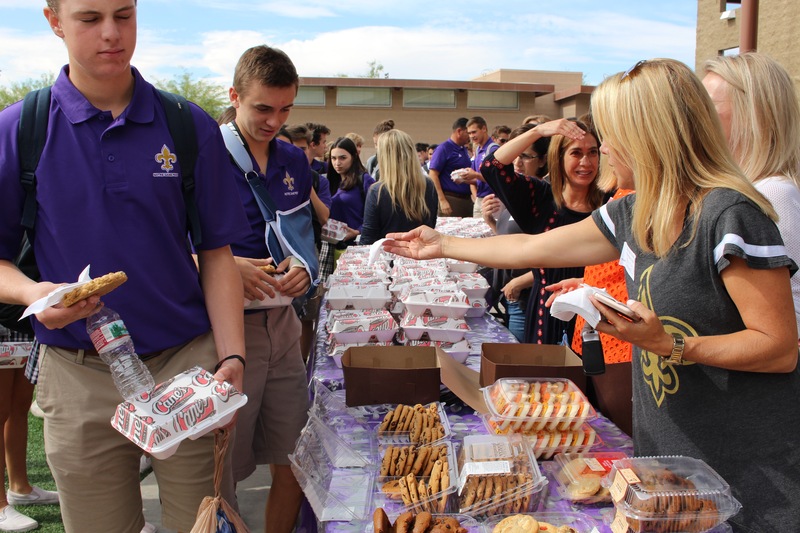 Two to three parents volunteer provide help represent the advancement office and various school initiatives ranging from reaching out on behalf of the Saints’ Fund to encouraging attendance at events for each of the grade levels. If you are interested in being involved with advancement efforts, please contact Georgie Hanlin, assistant director for advancement and annual campaigns at 480-634-8252. Notre Dame Prep Mothers’ Guild is a volunteer-run organization whose foundation is built on Guiding, Giving and Grace. Guiding our children, families and community of NDP Saints by welcoming, mentoring, supporting, and leading. Giving cheerfully and willingly to NDP with our time, talents and treasures. Serving and supplying the NDP family by our grace and most importantly with His grace. Through annual membership, Mother’s Guild provides NDP’s current and alumni moms with a wide variety of opportunities to be involved in the day-to-day life of NDP’s campus, students and community. NDP Dads' Club is an organization that supports the social, service and formational goals of NDP. Our Dads' Club is open to all fathers of current and former students who desire to grow closer to their children through fun and formative activities that promote and enhance the mission of Notre Dame Preparatory.